Trying to weigh livestock can be a frustrating experience, but Arlyn Scales has a line of floor scales, the 5200 Series, that should make your life a whole lot easier. These scales use strain gauge load cells, four to a scale, that are placed in fabricated pockets within the scale’s frame for more accurate weight measurements. An additional feature is a weight-averaging algorithm that can provide a true weight despite the fact that livestock may move around on the scale. Outlying weights that are far too heavy or light are automatically discarded. The weight data acquisition capability of our scales also eliminates human error and simplifies the weighing process. We can also manufacture custom floor scales to any specific size, so you are never locked into only our standard models. The Series 5200 Floor scales start out with a capacity of 2,500 pounds at a 0.5-pound resolution. The next standard capacity increment is 5,000 pounds with a 1-pound resolution. The 10,000-pound capacity scale has a resolution of 2 pounds, and the 20,000 capacity scale resolves to 5 pounds. Scale sizes range from 3 feet by 3 feet to 7 feet by 9 feet unless you express the need for a custom size. Your livestock operation requires sturdy equipment that can take the abuse that animals can deliver and Arlyn Scales are up to the task. We weld our scales together rather than using fasteners that can loosen and break over time. Our load cells are mounted in fabricated pockets within the scale frame, which protects them from dirt contamination and lowers the profile of the scales. As you may well know, animals can become stubborn when it comes to stepping onto a scale, especially if it’s high. Our low-profile scales help make it easy to get animals up on the platform. We can also fit rubber matting to help make the animals more comfortable and ensure easy clean up of waste. Our scales are designed to be hosed down for cleaning. The finish on steel models is a three-part epoxy paint that has a zinc component for resisting oxidation, even when the finish is scratched deeply. An optional finish on stainless steel platforms contains a garnet component that resists scuffing. Stainless steel construction provides further corrosion resistance and additional strength. When you order our Series 5200 Floor Scales with the optional USB thumb drive port, you can acquire weight data for nearly an unlimited number of animals to flash memory devices. The weight data can then be uploaded to computers. The data are stored as CSV files, which are universally accepted by most business and production software. If you choose to connect your scale directly to your PC, we offer free software that automatically imports the CSV files into Excel spreadsheets or Access databases. We also have a product that has been designed to sort pigs into their various feed pens by weight. Animals are contained on the scale after the entrance and exit gates are closed. A sophisticated algorithm takes many readings in just a few seconds and then disregards outliers and averages the results for an accurate measurement. Measurements are then recorded to a CSV file and a computer decides which of up to five routes the pig will take afterwards. This system is useful for sending underweight pigs to different feeding areas and for separating possibly ill animals from the rest. At your request, we can also furnish this equipment with an RDIF ear tag reader. Livestock of course comes in many forms besides pigs. So while your needs are likely different from those of pig farmers, we have a great deal of experience with automating systems in both the agricultural and industrial arenas and can help you do the same. 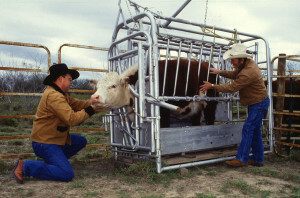 Checking livestock weight is important for keeping animals healthy and preparing them for market. Your focus might be on producing high quality fibers from sheep, llamas, or alpacas, and keeping track of animal weights will be part of the veterinarian processes to keep quality at peak levels. The potentials for automation are limited only by system design ingenuity. Just about any process can be automated to some extent, but this does not mean that your livestock operation has to enter the realm of factory farming. For example, our pig sorting system has a learning mode that gently introduces the animals to the system, thereby reducing their stress levels. We always keep in mind that happy animals are better producers and that technology done poorly can result in lost profits for you. We listen to your needs and engineer our scales and systems around them. You can order our scales with other digital options that support more advanced connectivity. The RS-232 two-way port allows you to directly attach a computer to any of our scales. This port allows both data acquisition from the scale and scale control from the computer. The RS-485 option allows the networking of up to 10 scales, and the wired Ethernet port option supports connecting to a computer network. Wi-Fi gives you wireless connection to a computer network. Whether you choose steel or stainless steel construction, our strain gauge load cells are all made from a special alloy of stainless steel. This is one of the reasons why our strain gauge load cells are so superior to those made by competitors, especially when it comes durability, accuracy, and longevity. Remember that we offer a broad range of capacities that should handle all your livestock weighing needs, and if none of the standard models fit exactly, you can always order our reasonably priced custom scales built exactly to your specifications. 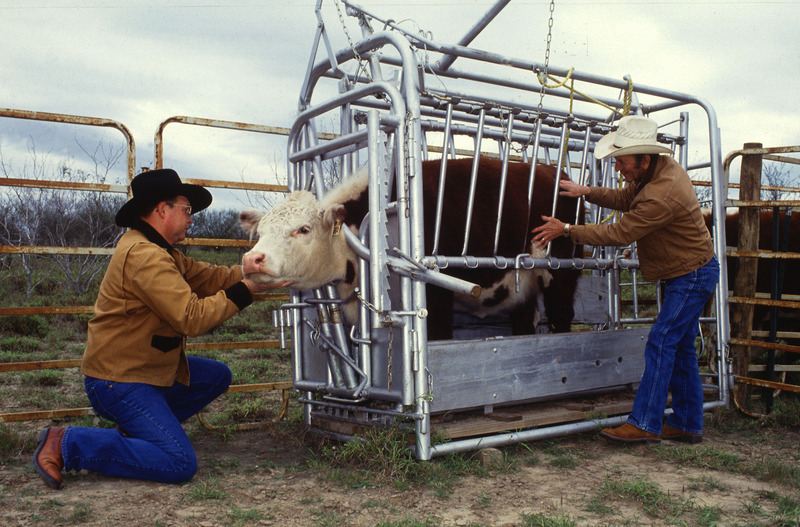 We use only the highest grade strain gauge load cells in our scales, and our scales are built to take all of the punishment that livestock can deliver. We can help you with your automation plans and reduce your labor overhead with our data acquisition capabilities. To get your questions answered and find the scale that perfectly meets your needs, contact us today! Call us at (800) 645-4301 or use the form on our Contact Us page or call us at (800) 645-4301 to get in touch.